Alright, That's a Start ~ The Bucky Channel - The World of Sports from Wisconsin's Perspective. I don't know if Wednesday's victory makes up for the brutalness the last few games have been filled with, but hey, it's better than a loss. The Brewers somehow salvaged the series, and prevented getting swept at home for the first time since the Cubs dashed our NL Central hopes. It wasn't pretty, but the Brewers were able to top the Reds 4-3. Once again, the Brewers offense was non-existent early, and the only guy that was doing anything with a bat was CC Sabathia. He hit an RBI double in the 3rd to put the Crew up 1-0. The lead was short lived, as Jerry Hairston Jr. hit a 3 run shot for the Reds in the 5th, leading many Brewers fans looking for either the nearest loaded gun, or the closest tall building. 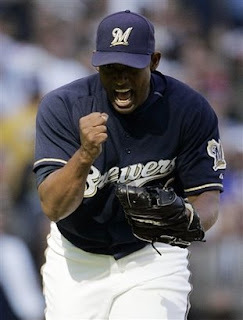 But the Brewers rebounded, thanks to a throwing error in the 7th which scored Mike Cameron. In the 8th inning, the Brewers had a golden chance with the bases loaded and nobody out. Tony Gwynn Jr. was at the plate, and I guarantee you at least 90 percent of Brewers fans knew he would ground into a double play. He did, but it scored a run, so I guess that was ok. Determined not to blow yet another game to the lowly Reds, Mike Cameron delivered with a single to left, which was able to bring home Ryan Braun. Torres redeemed himself with his 27th save of the season, and you could see how relieved the Brewers were to untuck those jerseys of theirs. So there you have it. Suddenly, things don't look so bad. The Phillies lost, and the Brewers are on a plane to Citizens Bank Park (that's it, right?) as we speak. The Cubs play St. Louis tonight, so we're guaranteed to gain ground somewhere. This next seven days will decide whether the Brewers make it into the playoffs or not. Four at Philly, three at Wrigley. The Brewers have to play their best ball or it's Yost is Toast time. I'm hoping for a 5-2 split, which would be more than ideal. In other news, Farewell, Laynce Nix. Hello Todd Coffey!